Yogurtland and DreamWorks Animation box-office hit Kung Fu Panda are teaming up to honor Kung Fu Panda 3 – the last of an animated trilogy. In a special promotion that began January. 4th, Yogurtland is bringing in five new flavors and collectible spoons inspired by characters from the film. - Po’s Panda Cookies and Cream: The perfect combination of dark chocolate cookie and sweet center filling packed into smooth frozen yogurt. - Lady Mei Mei Panda’s Warrior Passion Tart: An icy and tart-filled burst of pink passion fruit fills this new flavor with excitement. - Young Bao Panda’s Cherry Tart: A sweet, natural cherry twist loads the senses in this light and fun tart. - Beginning, 2/1, get Master Tigress’s Big Pop Sorbet: A combination of pineapple and cherry flavored sorbets that delivers a tiger-like punch in a cup. So yum!!! -Starting on 2/15, will be the final flavor release, Master Shifu’s Honey Graham: The light and smooth taste of this delicious frozen flavor makes for the perfect foundation to any and all adventurous Yogurtland toppings. There will also be graham crackers available as a topping! Yogurtland will also offer Po’s Power Crunch cereal, sold exclusively at Walmart, as a topping during the promotion. 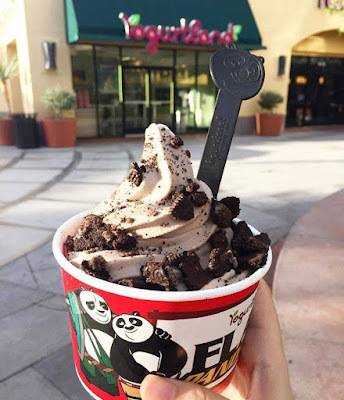 To kick off the promotion on Jan. 4th, the first 1,000 guests visiting each Yogurtland location will receive Kung Fu Panda-inspired fortune cookies to enjoy with their frozen yogurt or sorbet. 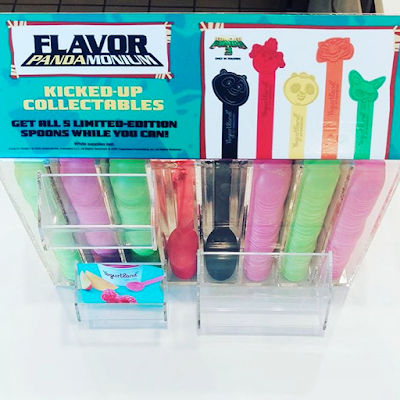 Yogurtland will celebrate its 10th anniversary and to commemorate the occasion and the completion of the Kung Fu Panda trilogy, limited edition Kung Fu Panda 3 key chains will be available while supplies last. Kung Fu Panda arrived in theaters January 29, 2016. 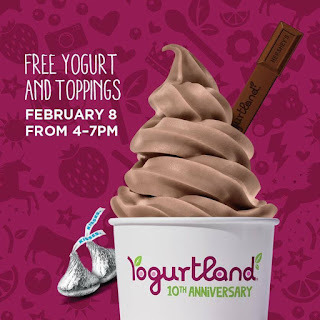 Celebrate National Frozen Yogurt Day with Yogurtland on Monday, 2/8 from 4-7pm at participating locations. Get a FREE 6oz yogurt and toppings. Guests will also receive a limited edition Hershey’s® collectible spoon. This year, Yogurtland’s celebration of all things frozen yogurt will include the return of two handcrafted flavors: Hershey’s® Chocolate Milkshake and Peppermint Pattie. There is also 2 limited toppings: Full-sized Reese's Pieces and Mini Hershey Kisses! 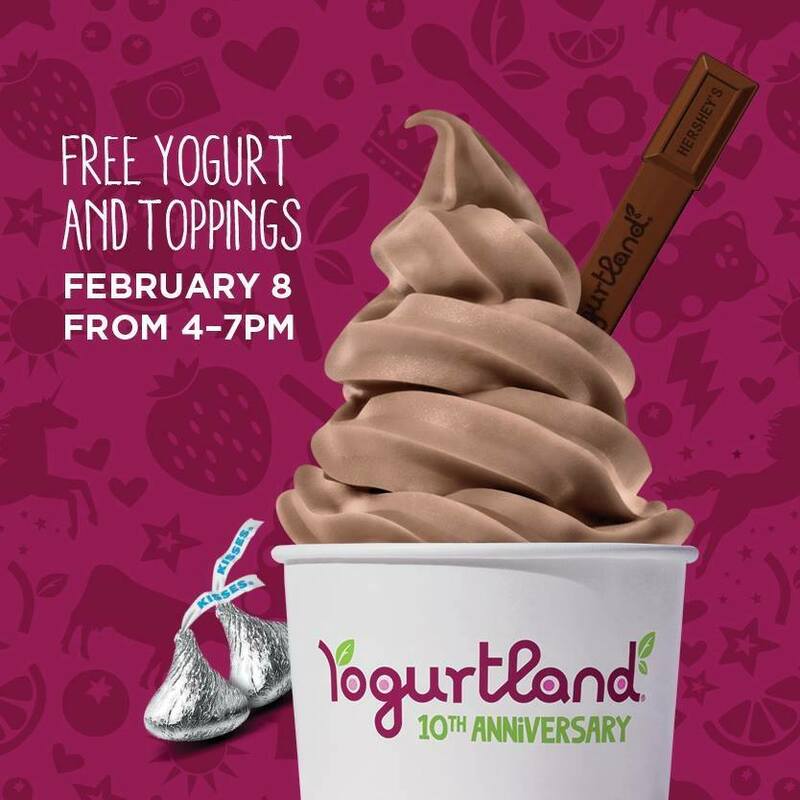 Yogurtland’s National Frozen Yogurt Day celebration is sponsored by Hershey and The California Milk Advisory Board.